Party Planning Idea Book from C.H.I.P.S. Lara Shriftman and Elizabeth Harrison are well known event planners. Their high profile A-list events include film premieres, store openings, charity benefits, product launches, and celebrity birthdays. Party Confidential provides an all-access pass to some of the most exclusive and creative parties they have ever come up with. Ten perfect parties are presented with gorgeous photographs to show how to stage a high-style fete whether you are throwing a fun sugar-themed birthday like Serena Williams had, hosting an authentic Indian feast like Ron and Cheryl Howard's, or planning to dance the night away Paris Hilton-style. 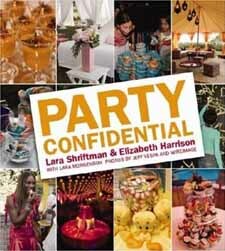 Party Confidential concentrates on each of the elements that make a successful event�the invitation, decor, lighting, food, music, and location--and offers tips for recreating the same ideas on a budget. Celebrities share their chic party tips, and high-profile restaurants and chefs contribute recipes.